I might have found something I love more than mossballs. (yeah, yeah, I read the posts, moss balls are so done- but I still love them ;) Anyway, my client, Sandy, gave me some little green balls from the farmer's market, saying they would keep crickets out of the house, and they're so beautiful to me! And they smell so good too. Sandy had a plastic bag filled with them from the farmer's market and she had planned to place them around her basement to scare the crickets away. She left them in the bag a day or so and before she even had the chance to place the balls around the room, the crickets had left! Sandy emailed me letting me know they're called osage oranges, so I did a little reserach. (And by "did a little research" I mean I googled 'osage orange.') According to wikipedia, they grow on trees and are not actually closely related to citus fruit but are actually in the mulberry family, called "Moraceae." The wikipedia article goes on to say, "The fruit has a pleasant and mild odor, but is inedible for the most part. Although it is not strongly poisonous, eating it may cause vomiting. However, the seeds of the fruit are edible." hmm... so there goes the answer to my question of 'what do they taste like?' I'll never know. It's interesting that most native animals don't use it as a food source because typically seeds are dispersed by animals. "One recent theory is that the Osage-orange fruit was eaten by a giant sloth that became extinct shortly after the first human settlement of North America. Other extinct animals, such as the mammoth, may have fed on the fruit and aided in seed dispersal. 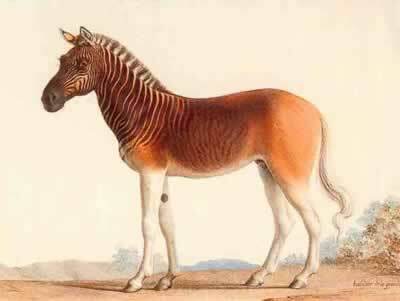 An equine species that went extinct at the same time also has been suggested as the plant's original dispersal agent because modern horses and other livestock will sometimes eat the fruit." Speaking of stores & what's up with me, here's the lastest. I'm opening up an online store, "Pure Style Home" and am working on finalizing the web design and picking inventory. I'm still having issues and my husband makes fun of me.... "HERE, PLEASE COME TO MY STORE.... I AM SELLING ELEVEN ITEMS. OH WAIT? YOU WANT THAT ONE? NO THAT ONE'S NOT REALLY FOR SALE... IT'S ONLY BEEN IN THE STORE FOR A WEEK. PLEASE COME BACK LATER." So yes, I'm definitely opening the online store but am still having issues choosing exactly what I want to sell. I know many of you have inquired about the rugs and yes, I will be putting them in the store. The 8x11 handmade wool antique look sun-washed rugs are in the $3,400- $4,000 range. ps- If you didn't get to see my previous post on Market, check it out & let me know if you're going! I wish I could find those in Utah. They're beautiful. I love the green. I'm having a hard enough time finding acorns here. I had to drive an hour and bribe my kids to help me hunt for them. Little do they know we'll be taking another hour drive tomorrow. Have a great day! OOOoo. I love those little oranges capapble of making species extinct! What power in a green little ball! Love all the opportunities you are working on too...and oh...Love that litle corner of the house! I just love osage oranges! Such a gorgeous shade of green. And the fragrance! When I owned a flower shop in Ottawa, Canada, we used to include them in our arrangements. But now that I live in Victoria, Canada, I haven't seen them in any of the flower shops. Darn! Hi,I am from Mississippi and those osage oranges look like what we call Horse apples in my neck of the woods!! They grew on huge trees here in my home town!! Not many trees left here now, but about 15 years ago, we began having the Bodock festival which they took the name from the bodock tree which the horse apples came from, I wonder if these are the same as your osage oranges. Thanks for sharing and stirring these childhood memories. Such a great post - very informative and makes me want to go to the Farmers Market here in Birmingham! Around here those are called Monkey's Brains (or balls) and more commonly called Hedge Apples. They do repeal bugs quite well. My grandmother would quarter them and put them in a plastic butter dish with holes poked in it to prevent any of us kids or pets accidentally giving it a gnaw. She never had bugs! I love them, and even used them as decoration in my November wedding. Everyone was shocked at how pretty something so organic could be. Great post; I've seen these balls in Ohio and never knew what they were!!! Where did you find the little white urns; I love them!!! I'm from central IL and these are everywhere. They are most commonly in between the fields in the hedge rows - we call them hedge apples :) They are beautiful though - we decorate with them at our furniture shows, but I think most people around here don't realize how great they are! So there’s a reason those animals are extinct but that fruit is gorgeous, love it’s color. Since we have about the same weather as the Midwest I’ll have to keep my eyes open to see if we have any of this fruit around. You’re killing us talking about your store all the time we want to see! We want to buy! Trust me when I say you can’t keep everything so share please. Thank you for a wonderful post and here’s hoping I find some of those balls. We have a giant (and by giant I mean the trunk is 6.5 feet in diameter!) osage orange tree in our yard. Last year we must have had over a thousand of those gorgeous green balls! Unfortunately we had to cut the tree down over safety concerns, it was beginning to split down the middle for the sheer weight of the limbs and we were afraid it would fall on our house or on the kids playing in the yard. We left a 12 foot tall portion of the trunk though and it has already starting shooting off new limbs! I am really hoping it will grow out and thrive again and get a second life! Did you know the wood is great to have outdoors? It is nearly rot-resistant! My husband is making some really nifty benches from a few of the limbs for around our firepit :-) Don't I sound like such a country bumpkin? I am totally in L-O-V-E with moss balls but it's true they're getting kinda old ... guess this is the next best thing! I Live in Cali so definitely will check if they grow anywhere around here ... they're sooo cute! Congrats on your online store & good luck! A house I used to own had this tree in the back yard. There are a few trees here in Chattanooga. Put some in a bowl once til they began to rot - yuck! I've seen those! But of course now that you've had the brilliant idea to bring them in I probably never will again! Good luck at Highpoint and with finalizing everything! I'm sure it's stressful but I can't wait bc I know it (whatever it turns out to be) will be amazing! I need some of these! I love the pop of color that they add to your entry. Very fresh. I'm so excited for this weekend. Can't wait to see you and your honey. Also, in regards to the store... you are wise to go slowly. Life is too short! You have your priorities in order. Those precious boys come first. Soon they won't want to hang out with you (believe me, it happens way too quickly!). Last year I was on a test drive and I saw some of those on the route. I started getting so excited, the car salesman thought I was a nut. I kept saying I was going to come back for them. I didn't buy the car, but just a couple days ago I was thinking about the hedge apples and thought I'd take a little drive (in my car that I bought from a different dealer) to see if I could find some of those cool green balls to decorate with. Have a blast at the market! Wonder if I can find them in S. Cal? We just bought a new home and somehow crickets get in! I've been trying to find how they get in, but if I can find something to repel them, that'd be even better! I know crickets are supposed to be good luck and all, but geez, they creep me out! We always called them Monkey Balls. I thought they were specifically for spiders. I ever got close enough to them to learn that they smell good because...well, they're monkey balls, hello! I actually live in Osage, Texas, not a town really, just a spot in the road. We have alot of the Osage orange trees on our ranch. Let me know if you need more. I'd keep that creamer too and I'd probably have trouble selling things I really liked as well - especially if they were one of a kind! Good luck letting go! Thanks for all the extra info about them. Sure didn't know they were possibly poisonous to eat! I just love finding FREE decor from the outdoors. My grandpa taught me those were called horse apples. Ha! Nice to know their proper name! hi lauren! i love your blog and read it almost everyday! it really has inspired me to decorate my home! i can't wait to check out your pieces at the loundon design center! btw, can you share which park you found osage oranges? :) thanks!! These are beautiful and look so pretty in your home, I wasn't sure what you were talking about at first because I was told they were monkey balls!! You know us girls from Indy are classy!! Love the osage oranges! And they look beautiful in your decor. I'm going to have to see if I can get some. Thanks for the info! 'Flowers" for addition to fall arrangements. I absolutely love these balls. I have a tree in my yard that busts them out, and they're gorgeous. But beware, when they begin to decompose, they stiiiink. My mom and I have been scouting out osage oranges for years...we both love the color and texture and you are correct there are trees in the area, but not many. I know of 3 trees and they are all in McLean and Vienna...I can save some for you if you wish??? There can be a ton and one can only put so much in one's home ;). I love the color of the oranges---I live in So. Cal but we have lots of farmers markets around the area, I'll search...I would love a few of them in a bowl. Good luck with your new adventures and keep us loyal followers posted. I love an interesting back-story and history lesson all rolled into a dose of pretty. Now i will be on the hunt to see if I can find some this far south. I love how they look in your milk glass. Will you do a follow up post on how long they last? I am so happy that I just found your blog. It's the epitome of everything lovely amd stylish. First off Osage Oranges YAY! Secondly, my husband says the same thing about me and selling things, thirdly, sounds like a great compromise, and Fourthly HAVE an AWESOME time at Market! I love those--I remember them being all over Illinois when I was growing up. They apparently don't do so well in Alabama, as I've never seen them here. Never heard o' em. Lovely tho. Have fun at High Point and buy me something nice, ok? Yes, don't spread too thin on the new ideas. Just take it a manageable step at a time. It will all come in time and you will be amazing. Follow your instincts. Those are the strangest looking things ever! I've never heard or seen anything like them. But if they smell that great AND keep away bugs..they I have to find them! We call them monkey brains or monkey balls! I also use them for decorating but beware that when they start to age they get mussy. My husband and I live next to a hill and bowl with the balls each year. We can not wait for the brains to arrive! I am having the same trouble with selling items. If I had a million dollars I would not purchase just the items that I NEED (really want) and those are the items that I do not want to sell because I love them. I hear the attachment will fade in time. I look forward to your store. We called those green things "Horse Apples." On a totally different note, yesterday I painted my doors orange and then I freaked out and googled "orange door" and I found your blog. Love it and your home!! Funny thing is that my house was also built in the 70s and I have dubbed it the Tree House for the same reason. Quick question. What colors are on your exterior?? I love the gray and how it made your rock stand out. 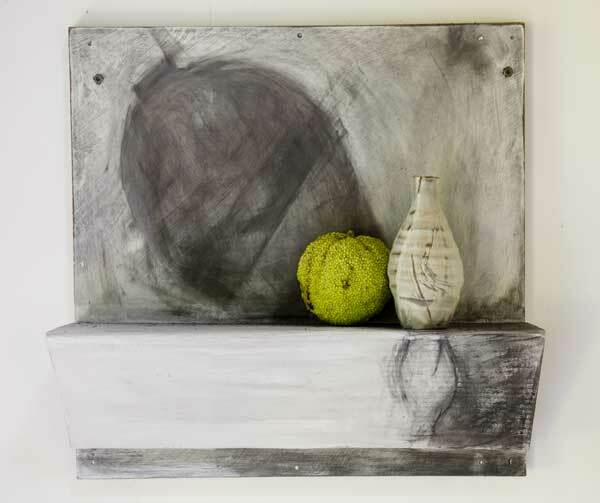 I also want to paint and may have to go with your gray and white. Ok too funny that you posted about this!! I was just walking my dog yesterday and my neighbor has one of these trees and the balls were laying all over the ground. And they are BEAUTIFUL!! Thanks for the tips, I'm going to go grab some!! I would do the same thing! I've literally pulled over on the side of the road and grabbed some awesome shaped sticks for a vase. Crazy people we are! I just picked about 50 of these lovelies at a local park; I use them every Fall as free decorating accessories around our home. I found them last year in Herndon, VA (right outside of D.C.) while I was visiting my father. They were much smaller than the ones here in North Carolina, but they're there! Okay... how is it possible that I have never heard of or seen these? I am really stumped. Wow. Very pretty and interesting fruit, though. I have always called them Hedge Apples. I have a tree full of them in my front yard.... wasn't until last year that I learned they would keep away spiders. There is a house near me that spray paints these and lines them along their fence that spans their ginormic house. They look beautiful at christmas in silver and red. I love osage oranges. I just started putting them around my house this summer and not only do they look interesting, but I swear there are less spiders... hmmm? These are absolutely amazing! (Oh and horses love to munch on these!) My parents have tons of them at their home in the country and I came home with a basketful this fall. They keep forever-- mine lasted in my dining room for over a month. Crate and Barrel also has some good fake ones that I snagged up! Hello! I have been researching and come up with your website. 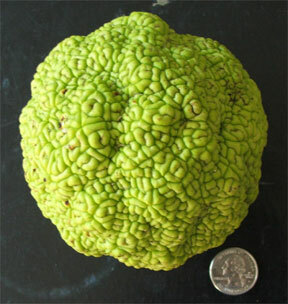 I have been looking WHERE I can purchase osage orange. I need thousands ASAP as we have a lot of spiders in the house. I have called a lot of stores locally and they have never heard of osage oranges. I will appreciate your input of where I can find some in Wisconsin. Thank you very much!